Fun activities at the library include: Petting zoo, used book sales, photography contests, visits by cartoon characters, and reading too. Check here for up coming book sales. We support the West Windsor Library to enable it to broaden its support for the community. We are composed of neighborhood volunteers who work to promote and strengthen their local branch library by raising awareness about the group, the library and by raising funds for the benefit of the local library. The Friends of the West Windsor Library is a New Jersey 501(C)(3) nonprofit corporation founded in 1981. Its funding is derived from charitable donations. 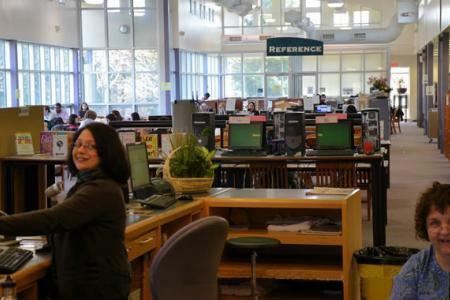 Board of Directors Meetings: The Board of Directors of the Friends of the West Windsor Library generally meets the third Tuesday of each month at 11:30 AM. These meetings are open to the public. Should a meeting be rescheduled, a notice will be placed on the Friends Bulletin Board, near the check-in desk. Those who are interested in volunteer opportunities are encouraged to attend. Our Annual Meeting will by on Monday May 20 at 7:00 PM. If you live here in West Windsor or use our library, get involved to support our mission. We accept volunteers regardless of skill level. Students can earn community service credits for school. Donations, both financial and of gently used books, are welcome.